Alley Of Books: I'd Tell You I Love You, But Then I'd Have to Kill You! I'd Tell You I Love You, But Then I'd Have to Kill You! This is a review I wrote for my high school newspaper! So if its a little different than my normal style then you're right because this was back in March/April 2008! "Okay...calm down..this is not what what you think it is. Its only the title of the book that I'm reviewing this month. 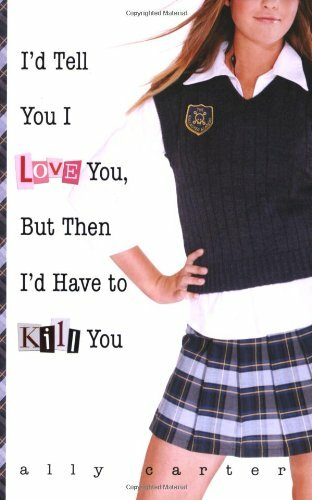 I'd Tell You I Love You,But Then I'd Have To Kill You... , by Ally Carter is the fist book in the Gallagher Girl series. Cammie Morgan, the protagonist of this novel is s normal teenager, but her life is anything but normal. She may be fluent in fourteen languages and capable of killing a man in seven different ways-three of which involve a piece of uncooked spaghetti- bu the Gallagher Academy has not prepared her for what to do when she meets an ordinary boy who thinks she is an ordinary girl. However, Cammie is anything but ordinary. Attending an all girls school for geniuses, A.K.A. "a school for spies", teaches them advanced martial Arts in P.E. Chemistry always consists of the latest chemical warfare and it is a common practice to break CIA codes to earn extra credit for computer class. In addition to the difficult and unusual schoolwork, she has to cope with the fact that her mother,an ex CIA agent, is the principal of her school.Staying afloat despite peer pressures, Cammie has to aid her "sisters" in a secret mission that may spell trouble for her mental and emotional stability. The book has also received some awards that make it viable for teenagers to read, so go ahead ans read it to see what it has in store for you; The best part is that it can be borrowed from our school library! " Looking back at this review I can believe how naive I was almost a year ago. Wow. If I were to write a review for this book today, it absolutely not be something like this! And hence tomorrow I shall grace you with a review of the second book in the series, Cross My Heart And Hope To Spy.